A trailer jet, or trailer jetter, is a high powered pressure washers designed to clear out and clean sewers, storm drains, and other similar drainage systems, as well as for facility maintenance and commercial use. Trailer jets are very large systems which are built onto trailer frames, hence their name, and are made to be towed by pickup trucks, ATVs, or maintenance vehicles. These pressure spray devices are powered by either a diesel- or gas-powered engine, making them completely self-contained systems. Trailer jets can be used with either hot or cold water. Cam Spray is a leading manufacturer of trailer jets and a wide variety of other commercial pressure washers, industrial water pumps, washing systems, and other similar equipment and accessories. 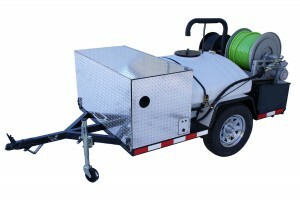 There are several similar pressure washer systems that can be thought of as simple variations of the trailer jet, which often eliminate the trailer from the system. These include van mounted jets, which are made to fit inside the back of a van or similar vehicle, and pickup mounted jets, which fit in the bed of a pickup truck.